Let's face it, moms are superheroes, but even superheroes need a little help from time to time. While over 70% of moms say it's important to live a balanced life, only 40% of moms say that they are the best parents they can be. In order to gain expertise and become knowledgeable in lifestyle and parenting topics, moms seek advice from friends, family, other moms, and topic experts who share their past experiences and wisdom on how to become better parents. As part of the POPSUGAR Insights #Momstamina study, we asked moms to tell us if they consider themselves to be an expert in any parenting areas. 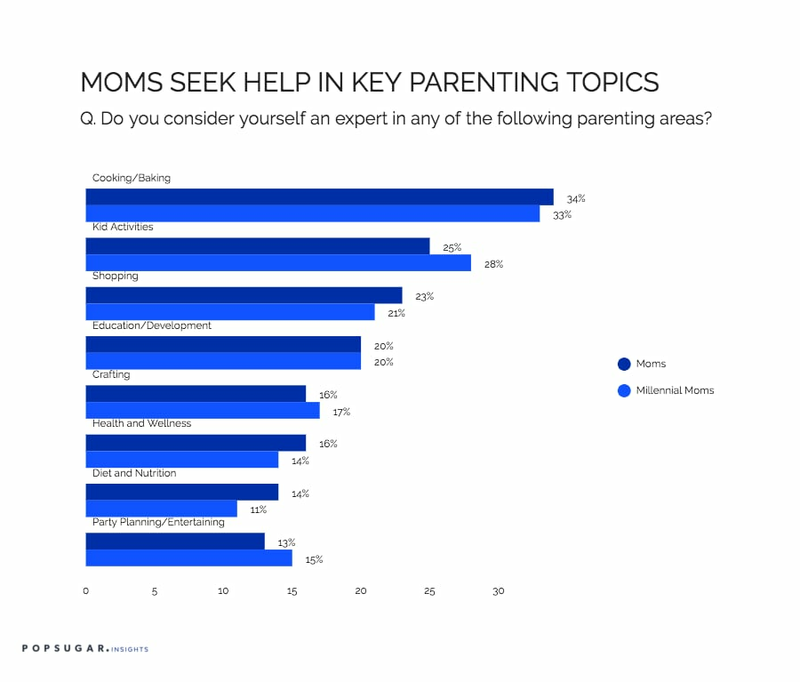 Perhaps not surprisingly, less than half of moms consider themselves to be experts on parenting-related topics such as cooking, education and child development, and health. Overall, only 34% of moms consider themselves experts in cooking and baking, 25% consider themselves experts in kid activities, and 23% consider themselves experts in shopping for their children. Less than one in five moms consider herself to be an expert for other parenting topics such as crafting (16%), health and wellness (16%), diet and nutrition (14%), and party planning or entertaining (13%). Millennial moms are slightly less likely to consider themselves experts in cooking and baking (33%), but they're 12% more likely to consider themselves experts in kid activities. Millennial moms are also less likely to be health and wellness experts (14%), but they're 21% more likely to consider themselves experts in diet and nutrition. Over 30% of millennial moms do not consider themselves experts in any of the above listed areas of expertise. Because of this, an opportunity exists for brands to develop content and partner with parenting influencers who can help moms feel more like experts in these areas. Millennial moms are 16% more likely to follow parenting influencers (43% for millennial moms vs. 37% for moms aged 25-49), and millennial moms follow influencers because they want to discover parenting tips and advice (50%), find recipes for the family (45%), learn new games and family activities (42%), and learn about new products (36%).